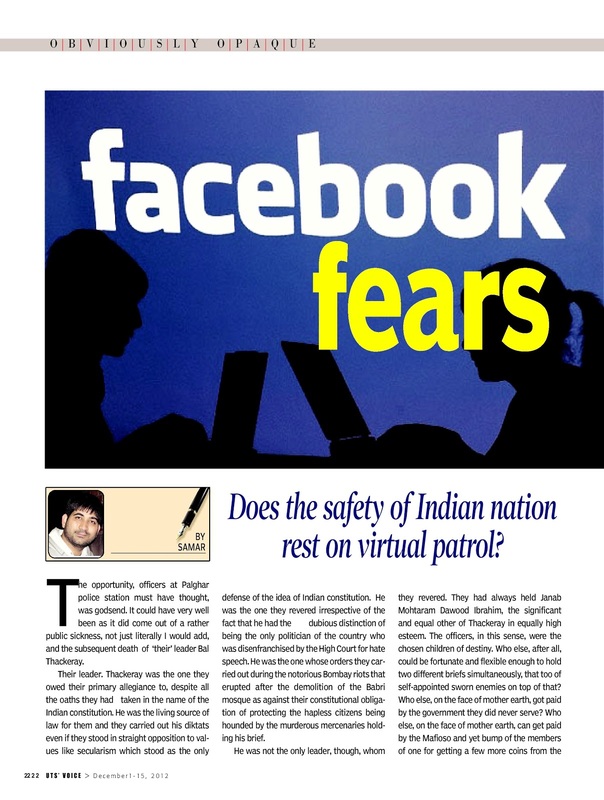 Facebook Fears: Is Government of India Out on Virtual Patrol? [From my column OBVIOUSLY OPAQUE in the UTS Voice 01-15 December. The opportunity, officers at Palghar police station must have thought, was godsend. 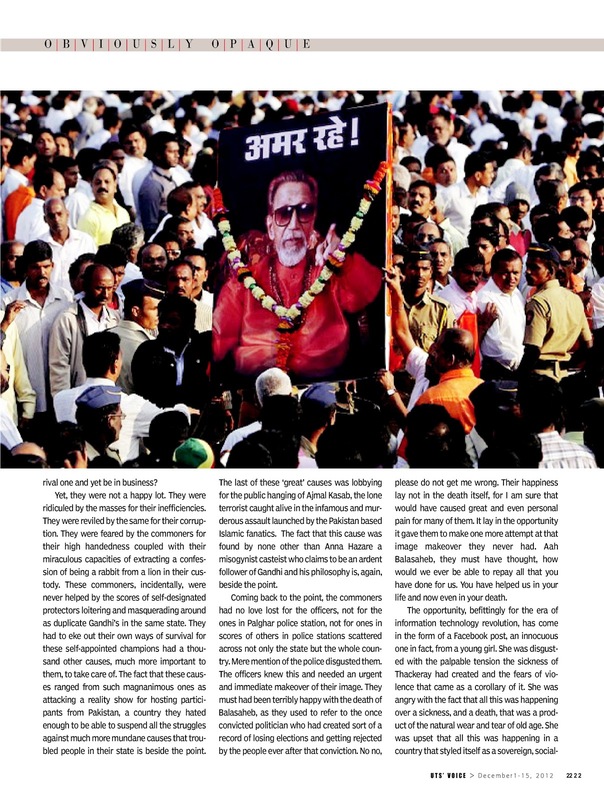 It could have very well been as it did come out of a rather public sickness, not just literally I would add, and the subsequent death of ‘their’ leader Bal Thackeray. Their leader he was. Thackeray was the one they owed their primary allegiance to, despite all the oaths they had taken in the name of the Indian constitution. He was the living source of law for them and they carried out his diktats even if they stood in straight opposition to values like secularism which stood as the only defense of the idea of Indian constitution. He was the one they revered irrespective of the fact that he had the dubious distinction of being the only politician of the country who was disenfranchised by the High Court for hate speech. He was the one whose orders they carried out during the notorious Bombay riots that erupted after the demolition of the Babri mosque as against their constitutional obligation of protecting the hapless citizens being hounded by the murderous mercenaries holding his brief. He was not the only leader, though, whom they revered. They had always held Janab Mohtaram Dawood Ibrahim, the significant and equal other of Thackeray in equally high esteem. The officers, in this sense, were the chosen children of destiny. Who else, after all, could be fortunate and flexible enough to hold two different briefs simultaneously, that too of self-appointed sworn enemies on top of that? Who else, on the face of mother earth, got paid by the government they did never serve? Who else, on the face of mother earth, can get paid by the Mafioso and yet bump of the members of one for getting a few more coins from the rival one and yet be in business? Yet, they were not a happy lot. They were ridiculed by the masses for their inefficiencies. They were reviled by the same for their corruption. They were feared by the commoners for their high handedness coupled with their miraculous capacities of extracting a confession of being a rabbit from a lion in their custody. These commoners, incidentally, were never helped by the scores of self-designated protectors loitering and masquerading around as duplicate Gandhi’s in the same state. They had to eke out their own ways of survival for these self-appointed champions had a thousand other causes, much more important to them, to take care of. The fact that these causes ranged from such magnanimous ones as attacking a reality show for hosting participants from Pakistan, a country they hated enough to be able to suspend all the struggles against much more mundane causes that troubled people in their state is beside the point. The last of these ‘great’ causes was lobbying for the public hanging of Ajmal Kasab, the lone terrorist caught alive in the infamous and murderous assault launched by the Pakistan based Islamic fanatics. The fact that this cause was found by none other than Anna Hazare a misogynist casteist who claims to be an ardent follower of Gandhi and his philosophy is, again, beside the point. Coming back to the point, the commoners had no love lost for the officers, not for the ones in Palghar police station, not for ones in scores of others in police stations scattered across not only the state but the whole country. Mere mention of the police disgusted them. The officers knew this and needed an urgent and immediate makeover of their image. They must had been terribly happy with the death of Balasaheb, as they used to refer to the once convicted politician who had created sort of a record of losing elections and getting rejected by the people ever after that conviction. No no, please do not get me wrong. Their happiness lay not in the death itself, for I am sure that would have caused great and even personal pain for many of them. It lay in the opportunity it gave them to make one more attempt at that image makeover they never had. 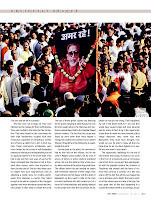 Aah Balasaheb, they must have thought, how would we ever be able to repay all that you have done for us. You have helped us in your life and now even in your death. The opportunity, befittingly for the era of information technology revolution, has come in the form of a Facebook post, an innocuous one in fact, from a young girl. She was disgusted with the palpable tension the sickness of Thackeray had created and the fears of violence that came as a corollary of it. She was angry with the fact that all this was happening over a sickness, and a death, that was a product of the natural wear and tear of old age. She was upset that all this was happening in a country that styled itself as a sovereign, socialist and secular republic. She was not alone in her pain. Her feelings were shared by millions of other Indians who have hated Thackeray for his divisive politics almost as equally as they hated Dawood Ibrahim(s). Far from being disrespectful to Thackeray, she in fact was much more guarded than these netizens who were openly expressing their anguish over Thackeray dying a natural death in his house instead of breathing in a jail where, they thought, he really belonged to. She had started her comment with a caveat ‘with due respect’ and then asked the question she was so fully entitled to ask. The question was equally innocuous; that why should a city, or a state, shut down on the natural death of a politician? The Palghar police would have none of it. All they needed was a complaint that duly came from a Shivsena activist who, for reasons known best to him only, entrusted himself to keep a tab on Facebook comments to express his grief for his leader. The police responded to the complaint with much more swiftness than they had ever shown even to a full-fledged terrorist attack. They descended, in no time, on the house of not only the girl who had posted the comment but also the lone one that had the misfortune of liking it and herded them to the police station. 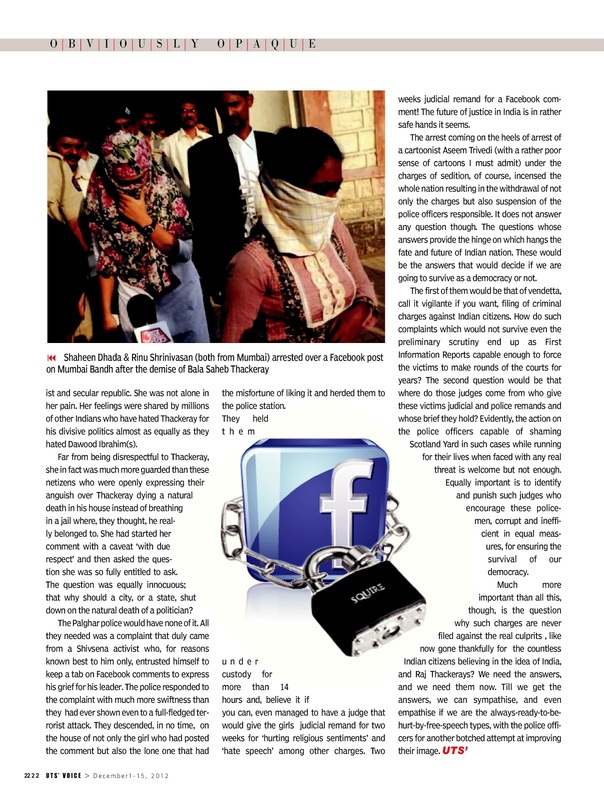 They held them under custody for more than 14 hours and, believe it if you can, even managed to have a judge that would give the girls judicial remand for two weeks for ‘hurting religious sentiments’ and ‘hate speech’ among other charges. 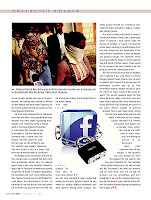 Two weeks judicial remand for a Facebook comment! The future of justice in India is in rather safe hands it seems. The arrest coming on the heels of arrest of a cartoonist Aseem Trivedi(with a rather poor sense of cartoons I must admit) under the charges of sedition, of course, incensed the whole nation resulting in the withdrawal of not only the charges but also suspension of the police officers responsible. It does not answer any question though. 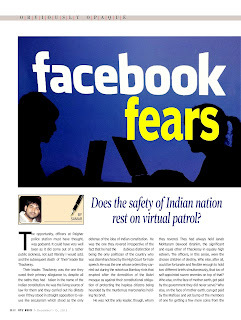 The questions whose answers provide the hinge on which hangs the fate and future of Indian nation. These would be the answers that would decide if we are going to survive as a democracy or not. The first of them would be that of vendetta, call it vigilante if you want, filing of criminal charges against Indian citizens. How do such complaints which would not survive even the preliminary scrutiny end up as First Information Reports capable enough to force the victims to make rounds of the courts for years? The second question would be that where do those judges come from who give these victims judicial and police remands and whose brief they hold? Evidently, the action on the police officers capable of shaming Scotland Yard in such cases while running for their lives when faced with any real threat is welcome but not enough. Equally important is to identify and punish such judges who encourage these policemen, corrupt and inefficient in equal measures, for ensuring the survival of our democracy. Much more important than all this, though, is the question why such charges are never filed against the real culprits , like now gone thankfully for the countless Indian citizens believing in the idea of India, and Raj Thackerays? We need the answers, and we need them now. Till we get the answers, we can sympathise, and even empathise if we are the always-ready-to-be-hurt-by-free-speech types, with the police officers for another botched attempt at improving their image.